A truss consists of an assembly of rigid but elastic members jointed in the form of triangles to act as a beam. The safe working tensile stress of mild steel is about 20 times that of structural timber. Thus steel trusses work out to be economical, especially for biggest spans. Out of the various shapes of steel sections, angles are considered most suitable for steel roof truss. This is on account of the fact that angles can resist both compressive and tensile stresses effectively. In additional angles can be produced economically and can be jointed easily. 1. Steel trusses are stronger than timber trusses. 2. Steel section forming the truss are light in weight and can be fabricated in any desired pattern to suit the architectural requirement. 3. There is no danger of the material being eaten away by white ants or other insects. 4. Steel trusses are more fire-resisting than timber trusses. 5. 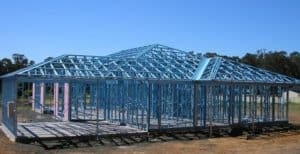 They do not have span restrictions and as such steel trusses can be used for industrial buildings and other such structures where large areas are required to be covered without obstructions due to columns etc. 6. The sections forming a steel truss are easy in transportation. 7. The sections can be obtained in any desired form or length to suit the requirements and there is not much wastage of the material in cutting etc. 8. On account of their easy erection techniques, the progress of roofing work with steel trusses is fast.